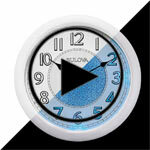 STEREO BLUETOOTH® LIGHTED DIAL WALL CLOCK. Moisture- and weather-resistant white molded case ideal for indoor/outdoor use. Responsive blue LEDs automatically turn on/off in low light. Compact silhouette. Protective glass lens. Quartz movement. Bluetooth® wireless stereo speakers included. 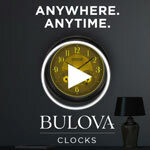 Streams music or programming from any Bluetooth®-enabled device. Universal charger included for the Bluetooth® system battery. Requires (1) AA and (4) C batteries, not included.